The unit load device market is projected to grow from USD 1.64 Billion in 2016 to USD 2.02 Billion by 2021, at a CAGR of 4.28% during the forecast period. The base year considered for the study is 2015 and the forecast period is from 2016 to 2021. 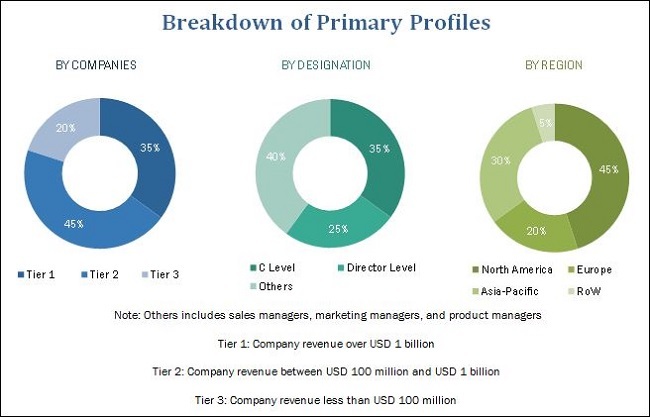 The report analyzes the unit load device market on the basis of product type (LD 3, LD 6, LD 11, M 1, pallets, others), application (commercial and cargo), material (metal, composite, and others), and container type (normal, cold, others), and maps these segments and subsegments across major regions, namely, North America, Europe, Asia-Pacific, and the Rest of the World. The report provides in-depth market intelligence regarding unit load device and major factors influencing the growth of unit load device market (drivers, restraints, opportunities, and challenges), along with an analysis of micro markets with respect to individual growth trends, future prospects, and their contribution. The report also covers competitive developments, such as long-term contracts, new product launches and developments, and research & development activities in the unit load device market, in addition to business and corporate strategies adopted by key market players. Market size estimation for various segments and subsegments of the unit load device market was arrived through extensive secondary research sources, such as annual report and publications from IATA, ISO, and the Boeing Business Outlook, among others, corroboration with primaries, and further market triangulation with the help of statistical techniques using econometric tools. All percentage shares, splits, and breakdowns were determined using secondary sources and verified through primary sources. All possible parameters that affect the market have been accounted for, viewed in extensive detail, verified through primary research, and analyzed to acquire the final quantitative and qualitative data. This data is consolidated with detailed inputs and analysis from MarketsandMarkets, and presented in this report. Some of the key market players in the unit load device market are Nordisk Aviation Products AS (Norway), Zodiac Aerospace (France), VRR Aviation (The Netherlands), DoKaSch GmbH (Germany), and Satco, Inc. (U.S.), among others. These players adopted strategies, such as contracts, new product developments, agreements, and collaborations to strengthen their position in the market. The unit load device market is projected to grow from USD 1.64 Billion in 2016 to USD 2.02 Billion by 2021, at a CAGR of 4.28% during the forecast period. Various factors, such as increase in demand for lightweight ULDs, growth in international trade, and increase in demand for cold containers are expected to drive the unit load device market. The market is segmented on the basis of product type, application, material, container type, and region. The product type segment is further divided into LD 3, LD 6, LD 11, M 1, pallets, and others. Based on product type, the LD 3 segment is estimated to grow at the highest CAGR during the forecast period. The LD 3 container is mainly utilized in passenger aircraft and growth in the LD 3 container segment can be attributed to the increase in passenger traffic. 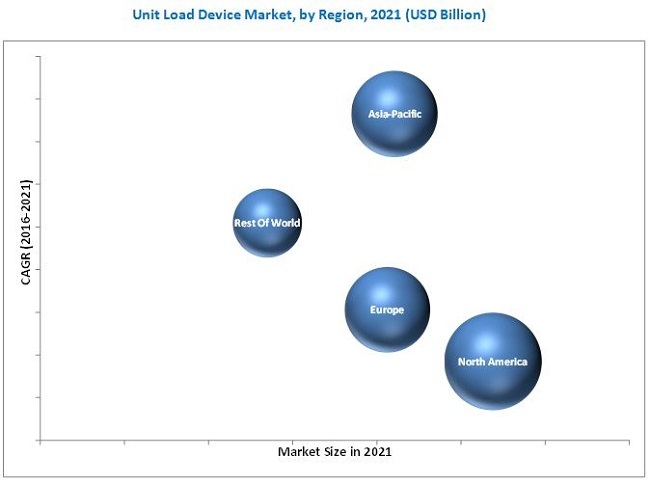 Based on application, the unit load device market is segmented into commercial and cargo. Commercial is the largest application segment. Rise in passenger traffic has led to increase in air cargo, thereby propelling the demand for unit load devices for commercial aircraft. Based on material, the unit load device market is segmented into metal, composite, and others. The composite segment is estimated to grow at the highest CAGR during the forecast period. The aviation industry prefers containers made of composite materials due to high maintenance and replacement costs of aluminum containers and pallets. Based on container type, the unit load device market is segmented into normal, cold, and others. The normal container segment is estimated to grow at the highest CAGR during the forecast period. Normal containers are used to transport dry cargo. Some of these containers are made of composite materials that are lightweight and durable. Normal containers are used in commercial aircraft as well as cargo aircraft. Rise in aircraft orders will significantly contribute to the increasing demand for unit load devices. The demand for unit load devices is the highest in the Asia-Pacific region and is expected to grow in the future. Based on region, the market is segmented into North America, Europe, Asia-Pacific, and the Rest of the World. North America is estimated to lead the market in 2016. Emerging economies, such as China and India are estimated to drive the Asia-Pacific unit load device market. Increase in disposable income of people has resulted in rise in the number of passengers travelling by air. This has further led to increase in cargo traffic, which has contributed to the growing demand for unit load devices in this region. However, factors, such as high repair cost of unit load devices, and stringent rules and regulations limit the growth of this market. Products offered by various companies in the unit load device market have been listed in the report. The recent developments section of the report includes recent and important developments by various companies between 2014 and 2016. Major companies profiled in the report include are Nordisk Aviation Products AS (Norway), Zodiac Aerospace (France), VRR Aviation (The Netherlands), DoKaSch GmbH (Germany), and Satco, Inc. (U.S.), among others. Contracts accounted for a major share of the total growth strategies adopted by the leading players in the market. This strategy has enabled companies to strengthen their position in the market.